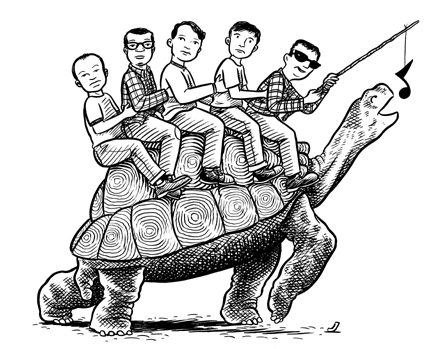 Illustration of Chicago area band, Tortoise, done for The Rocket. (My apologies to children's book illustrator Wilfrid S. Bronson) India ink on bristol board. Art area is approx. 7" x 6". Comes framed at a size of 10" x 8 1/2", with grey mat and backing board. NOTE: Two tiny whiteout marks, hardly visible.